My head is spinning from all the scrappy things going on lately!!!! 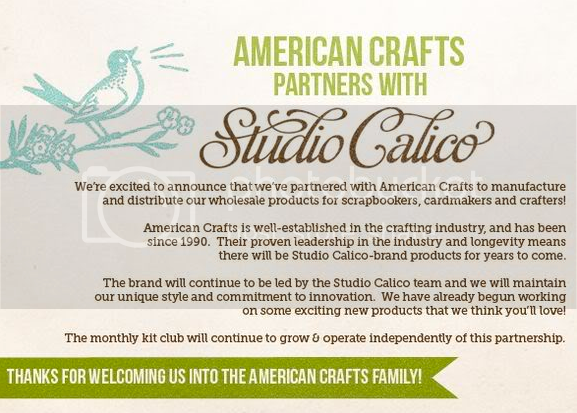 It's funny, I just started subscribing to Studio Calico kits and hoarding all their product cuz they're like the big thang in scrapbooking right now and then whatdoyaknow - AC and SC combine forces! It's my lucky day! Who should I start hoarding next... maybe AC will buy them too, haha. Second - AC just purchased Crate Paper, too! Third, I made the Scrapbook Circle Design Team for the term of November 2011 - April 2012! Woohoo! 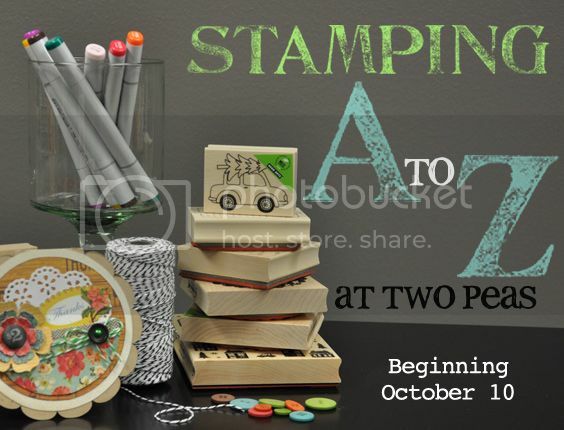 Fourth, Two Peas has a special A-Z stamping promotion starting on October 10th! Now I've gotta bust out my stamping supplies and get to making the card that will be featured for American Crafts! I know I know, enough with the scrappy stuff already, Paige! Since next week is Fox's 1st birthday, starting on Tuesday the 11th and leading up to his party on the 15th, every day is going to be focused on him. Pictures, videos, favorite posts, all things Mr. Fox. Studio Calico products always make my heart swoon, so I'm all for this AC combo! And I was hoping that some of the scrappy news was that you would be taking over for Jen at the magazine; I just heard about her departure and I'm so sad/happy for her! She's one cool lady. Thanks for keeping us in the know! Congrats on the DT!! Always love your scrapbooking layouts! They are so lucky to have you! And I'm excited about Two Peas' stamping event! YAY! I can't wait to see what you do for Scrapbook Circle!! SO excited for you and all this wonderful news! So cool! I am excited to see what the SC/AC partnership brings. I am obsessed with SC kits and AC products. Sounds like a win to me! Congrats on your design team. That is great news! Yipee!!! Congrats and welcome to the team--SO extremely excited to be working with you! and I agree about studio calico--TOTALLY sweet! 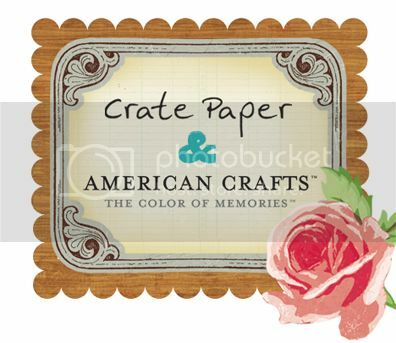 I am also guilty of hoarding SC product--I scoured online stores to find a few remaining wood veneer butterflies and have been saving them ever since :) So excited to be working with you at Scrapbook Circle! Do you remember my short-lived obsession with stamps? That was fun. . .but it was always soooo messy! Annnd, I don't know much about the scrap world, but if you're posting about it, it's gotta be great! Yippee! Congrats on making the Scrapbook Circle Team!! You deserve it!!!! Congrats Paige, that's FAB news, have fun designing for your new team, and AC and SC...match made in heaven!! Congrats on the DT :) I am sooooooo looking forward to the party pics!! congrats on the design team! you are amazing and are totally going to take over the world... but not in creepy bad way.... in the your great and every one loves way. Congrats, Paige!! Looking forward to seeing more Fox party prep, too. I'm hosting a baby shower in a little over a week, and I think it's going to take a magic wand to get everything accomplished that I've dreamed up. Eek! u have much fun!!! and like the following of how u preparing Fox's 1st birthday!! !